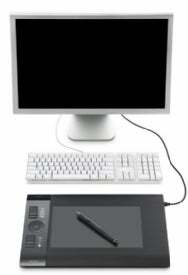 Tablet-maker Wacom on Wednesday introduced its next generation of pen tablets designed for the creative professional. The Intuos4 brings new features and improved pen performance, the company said. The improved pen is capable of up to 2,048 levels of pressure, which enables it to capture very slight pressure applied to the tablet. Wacom says the results are similar to working with traditional brushes, markers, and pens. The Tip Sensor technology used in the pen and tablet offers what Wacom describes as “near-zero” starting pressure—the actual starting pressure is one gram—to let users apply a very light touch. The pen also features a pressure-sensitive eraser and two side switches that you can use for double-click and right-click functions. The tablet itself has undergone some changes with the Intuos4 release too. The tablet includes a configurable Touch Ring that you can use to control up to four different functions in any application. A button in the center of the ring lets you switch between functions such as zoom, scroll, brush size adjustment, canvas rotation, and layer selection. The tablet’s new design makes it easily reversible for left-handed use, with the Touch Ring and all of the shortcut and modfiier keys on one side (just rotate the tablet 180 degrees). The tablet also features Organic Light-Emitting Diode (OLED) displays, giving hints about the current function of each of the customizable ExpressKey (on all models but the small version). The Intuos4 is available immediately in four sizes—small ($229), medium ($369), large ($499) and extra large ($789).